The Bank of America Corporation (BAC) is an American multinational investment bank and financial services company based in Charlotte, North Carolina. The bank has central hubs in New York City, London, Hong Kong, Minneapolis, and Toronto. Bank of America is one of the “big four” major money center banks in the country, along with Wells Fargo, JPMorgan Chase, and Citigroup. Not only is BAC a major U.S. financial institution, it’s also a favorite among many high-profile investors, including Warren Buffett. According to Investopedia, “the largest shareholder of Bank of America stock is an institutional investor, Warren Buffet’s Berkshire Hathaway, with 679 million shares held, or just under 7% of the company. Following close behind is mutual fund operator The Vanguard Group Inc., with a reported 673 million shares as of a 2018 SEC filing, amounting to 6.72% ownership.” But is the stock, which is currently trading at $27/share worth buying right now? From a fundamental point of view the company has a lot going right. It has a huge market cap of $260 billion, and is making $66.8 billion each year in revenue and growing. It has the fasted 5-year EPS growth rate compared to its 3 top competitors at 190%. And it’s current price to earnings ratio of roughly 10.4x does not make BAC an expensive stock. Analysts are predicting the bank will earn $3.20/share of profit in its 2020 fiscal year. That would provide a decent gain of 23% if the P/E ratio stays the same. However we need to look at other factors as well. One headwind for the stock right now is the recent global trade war between China and the US. This could threaten global growth and credit demand. Furthermore, the latest numbers from the Institute of International Finance reports that in September of 2018, worldwide debt totaled $244 trillion, or nearly 318% of world gross domestic product – a new record. A lot of this comes from growing private debt, and non-financial business debt. For example, delinquent U.S. student loans reached a record $166 billion in the last quarter of last year. “But since “delinquency rates for student loans are likely to understate effective delinquency rates” by about half, according to the Federal Reserve Bank of New York,” the actual figure is probably much higher. Interest rates are also higher today in North America than a few years ago. So many homeowners who are looking to renew their mortgage will need to re-negotiate at a higher rate. Research institute Veritas Investment recently slapped a sell rating on shares of 6 large banks in Canada. Financial services has been a rewarding theme for investors so far this year. Even Bank of America is up 8% so far in 2019. But the economy isn’t growing as quickly as people are borrowing so many experts believe the banking sector will slow down in the next 12 months. The other issue with BAC is from a technical side. 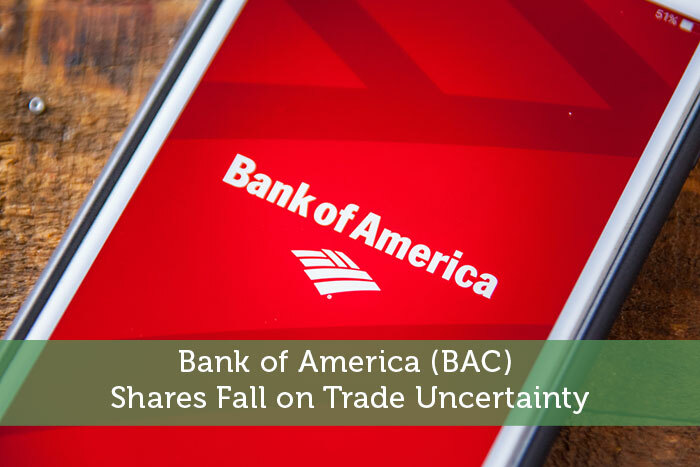 Due to some recent troubles with China and the questionable future of the economy shares of BAC is down 15% from its peek of $32. In just the past week alone the stock dropped 10% as fears about the trade war continue to be on investors’ minds. The 20 day simple moving average (SMA) recently fell below the 50 day SMA earlier this week which signals a bearish sentiment in the markets. It’s hard to recommend BAC with the negative price momentum. But the stock should produce favorable investment gains in the long run. It’s generally not a good idea to buy a stock on its way down. So it might be smart to wait until the technicals for BAC have improved before considering an entry point. This author holds 150 shares of BAC as of writing this post.